Let's Learn To Care For Our HOME Inside And Out! 1. Think about each room in your home....what ways can you be more cautious, concerned and consume less in each? 2. Think about everything in your yard...what could be hazardous or wasteful, what can you do to protect it? 3. Think about products you buy to bring into your home, is everything safe and efficient, are you using too much packaging, too many disposables or the unhealthy chemicals? 4. Draw your own picture of your home...mark the areas you can be more careful. Post it for the whole family to see. Ideas and tips to help you conserve and preserve in every room at home! In General, Be Careful With Things You Use and Don't Abuse! Close doors and windows tight, so heat or ac does not seep out. Fill empty space in your freezer with milk bottles of water (uses less energy)! Think about how often you use indoor and outdoor appliances etc, such as grills, lawnmowers, sprinklers etc. Don't leave the refrigerator door open decide what you wan to eat before you open it! Use cloth napkins instead of paper for towels, napkins etc. Us the short rinse cycle on your dishwasher. Reuse water....to water plants...can you think of other ways? Open the flu when you use the fireplace! Don't throw anything unnecessary in the trash, freecycle, give it away! 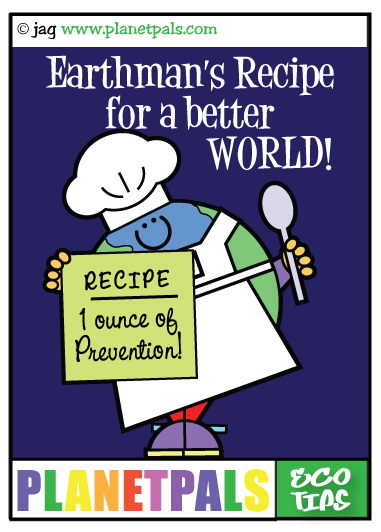 We are sure you can think of many other home saving, Earth friendly ideas! Moonbeam says think about that trash before you toss! 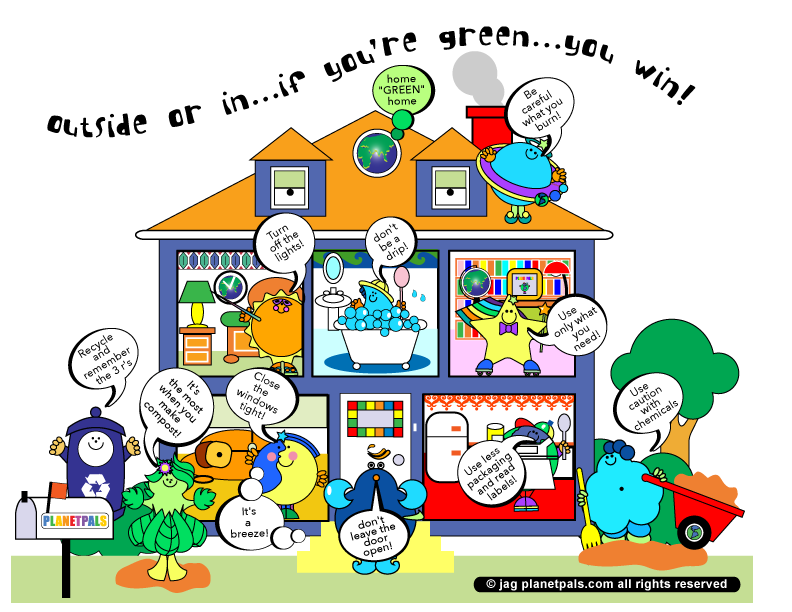 Sunnyray says watch electricity and energy consumption! Breezy says careful what you breath...watch for hazardous materials! Now be healthy inside: Food Precaution Ideas and Nutrition ideas! 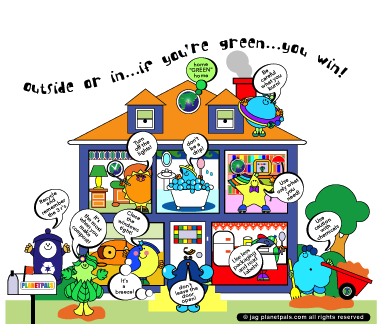 See Planetpals America Recycles Day Page!